Franchise Business Review is celebrating its 10th year as a source of awards and positive rankings for franchisors trying to sell more franchises. Unhappy Franchisee is celebrating by taking a close look – for the first time – at its methodology, methods and representations. (UnhappyFranchisee.Com) Unhappy Franchisee is investigating Franchise Business Review and trying to determine whether it is a legitimate franchise marketing research firm, which it claims to be, or just a seller of awards and rankings to credibility-hungry franchise sellers, as its critics claim it is. After reading through one of its publications, the FBR Special Report: Senior Care Franchises we had a number of questions and concerns. 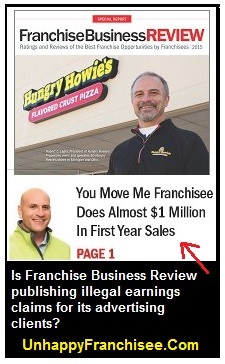 We sent many of these questions a few days ago to Franchise Business Review CEO Eric Stites, President Michelle Rowan, and Editorial Director Molly Rowe but have not received any answers. We have added a few more and are inviting them, once again, to provide clarification on some pretty basic issues. We have dealt with professional research organizations in the past, and find that they have detailed explanations of their methodology at the ready and can generally answer the most complex questions at a moment’s notice… especially when someone starts questioning the validity of their research. Are you familiar with Franchise Business Review and the validity of its research techniques and results? Please share your opinions or questions below. How many different franchise systems were the 1,300 senior care franchise systems from? Did you send surveys to franchisees of the “more than 30 franchise companies,” just the 17 that appear on your list, or some other amount? How do you get the contact information to survey franchisees whose franchisors have not contracted with Franchise Business Review? How many of the 17 top Senior Care franchises have NOT paid FBR for surveying, advertising and/or lead generation? Our concern: Franchise Business Review (and its top franchisors) positions the franchises on its lists as the “Top Franchises” and the “Best of the Best” in terms of franchisee satisfaction in their industry segment. But are they really only ranking companies that paid for or cooperated with the FBR survey program? FBR’s response: No response yet. By excluding franchisees who were terminated, whose franchises were reacquired by the franchisor, or who otherwise ceased operation, isn’t Franchise Business Review excluding an important segment of the franchisee population and skewing the results to the positive? Our concern: Franchise Business Review claims to be an independent market research firm, but excluding failed franchisees is one of several elements likely skewing the results positive. FBR survey reports state: “All active franchise owners were invited to participate in this survey process… Franchise owners were made aware of the survey process by their corporate office and encouraged to participate and share their honest feedback regarding their franchise experience. 3) a sample size as small as 10 respondents. This would further dispel any notion of anonymity. 33% – 37% of the franchisees of several top-rated senior care franchises did not complete the survey despite the encouragement of the franchisor and three attempts to get them to do so. It would seem likely that unsatisfied franchisees would not respond or skew positive to prevent negative repercussions. Our concern: Franchise Business Review claims to be an independent market research firm reporting the unbiased truth, but FBR seems to have created a methodology that intentionally skews the results positive. There seems to be an inherent conflict of interest here, since only franchisors with good ratings will want to advertise with Franchise Business Review. Your list of survey questions does not include questions related to actual gross revenue, profit margins or the income of senior care franchisees. You do not cite a source for these statistics. Can you cite the source of the statistic that it’s not uncommon for top senior care franchises to gross more than a million dollars with gross margins of 30% to 40%? Our concern: Franchise Business Review clients and advertisers are distributing and quoting unsubstantiated Financial Performance Representations and may be violating FTC and state franchise regulations. Both Synergy Homecare and Homewatch Caregivers are prohibited by the FTC Franchise Rule from providing break-even representations to prospective franchisees – the audience for this guide. Several senior care franchises have the statistics in the last question posted in the franchise marketing sections of their websites. Our concern: Franchise Business Review are putting its clients and advertisers at risk by disseminating earnings representations disguised as editorial content and independent research. When these representations are provided by the franchisor to prospective franchisees, they may become Financial Performance Representations that they neither disclosed nor can substantiate. ARE YOU FAMILIAR WITH THE FRANCHISE BUSINESS REVIEW & THE FBR SENIOR CARE FRANCHISE REPORT? SHARE A COMMENT BELOW. ← QUALICARE Franchise Providing Illegal Earnings Claims? Oh Eric Stites you been called out. What do you say about this? Eric Stites if you truly have a research firm you should welcome this enquiry. When can we expect to hear from you? Eric, Michelle and Molly are you going to give the franchisors a refund on the money they spent to advertise on FBR? Since you misinformed them about making earnings claims? Franchise attorneys for franchise owners are going to use this against franchisors. Franchisor attorneys are going to use this against Franchise Business Review. FTC is going to go after Franchise Business Review and franchisors. Hi Eric Stites how’s it going bud? Eric, Michelle and Molly where are on this? Eric, Michelle and Molly what has the FTC had to say to you, if anything on Franchise Business Review’s reports?